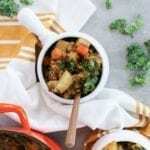 This all-time favourite recipe with a healthy twist is loaded with seasoned ground turkey, lentils, and veggies, all cooked in a savoury broth, then topped with fluffy potato and celery root mash. 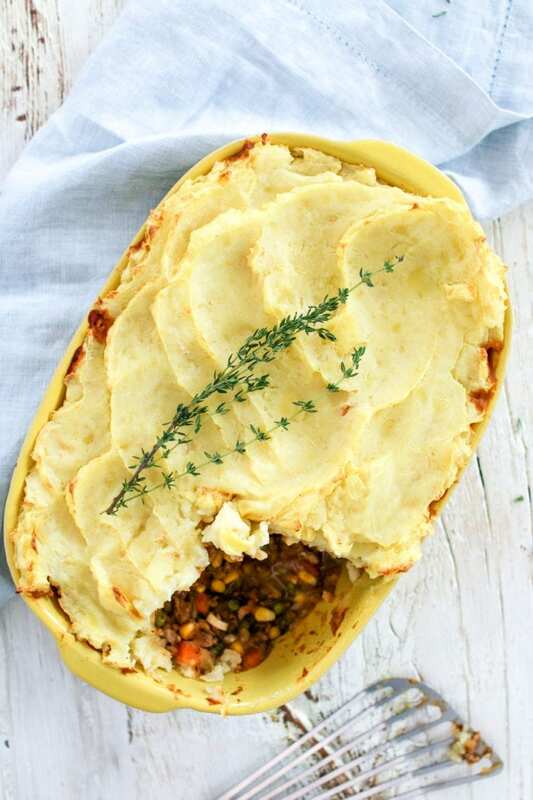 A warm, hearty meal that is sure to please the entire family! 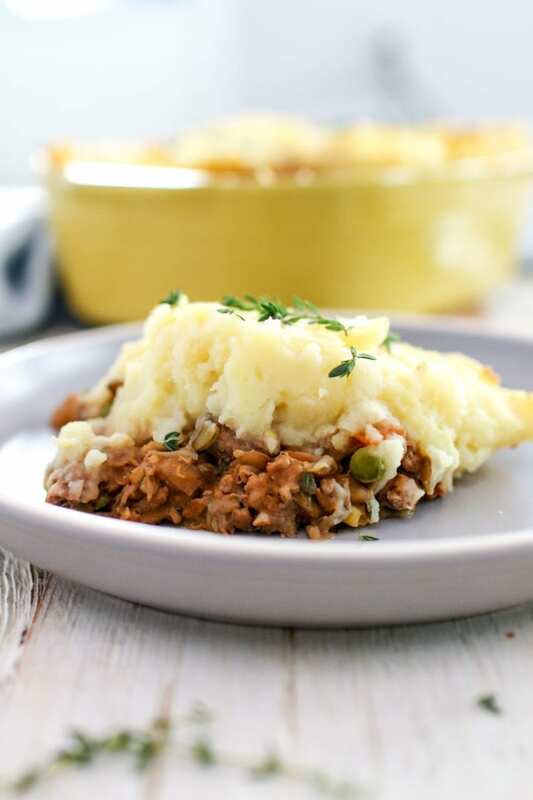 Growing up, Shepherd’s Pie was on regular rotation in Gigi’s (aka Mama HealthNut) kitchen, especially in the fall and winter. She pretty much whipped it up on a moment’s notice using up whatever ground meat and veggies were in the fridge. I really wanted to re-create this favourite childhood dish with a healthy twist! While testing out this recipe, I felt so nostalgic I just had to call her for some tips and tricks: hence how the red wine was snuck into this recipe…haha…thanks Gigi!! This of course is optional but highly recommended. 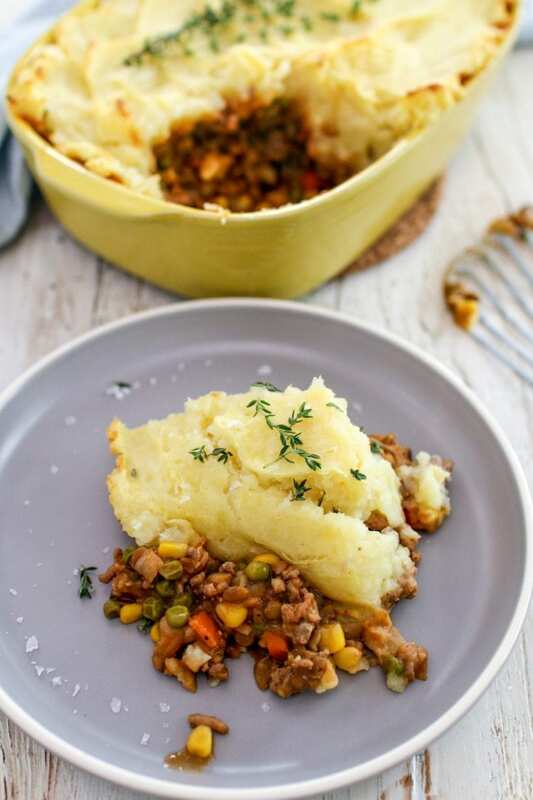 Rather than taking the traditional route of using ground beef or lamb, I decided to use a combination of ground turkey and lentils, which adds an extra dose of protein and fibre and makes for a delicious combo. 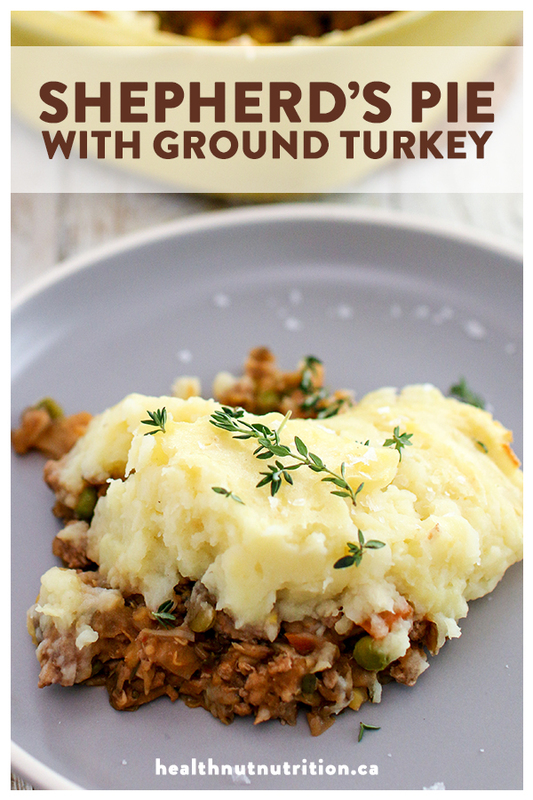 But you can easily switch this up by using ground beef, lamb or just turkey, or all lentils for a vegetarian option. Just keep in mind that if using only lentils, you will have to increase the quantity of both the lentils and the broth by at least one cup. I also wanted to lighten up the mashed potatoes by adding celery root, which is not as starchy, and gives it this wonderful subtle celery taste that is absolutely delicious! If you’re not familiar with celery root or celeriac, I highly recommend you give this scary looking vegetable a try. Highly popular in most European dishes, it just doesn’t seem to get the same kind of love here in North America, but I’m here to change all that! I know most people pass on this odd looking vegetable, but don’t judge this ugly duckling when passing through the vegetable aisle. Celery root is high in dietary fibre which is great for the digestive system and provides an excellent source of vitamins C, K, B-6, potassium and phosphorous. I’m telling you guys, once you peel through that hairy ugly skin, underneath you will find the most fragrant, earthy intense flavour that will make you wonder how you ever skipped over this not so pretty root vegetable. And before you ask, no you can not substitute this with your green celery, leave that for your soups and stews and juicing machine. Let me know in the comments below your favourite childhood recipes. I would love to give them a try, and maybe I can even put my own healthy spin on them. 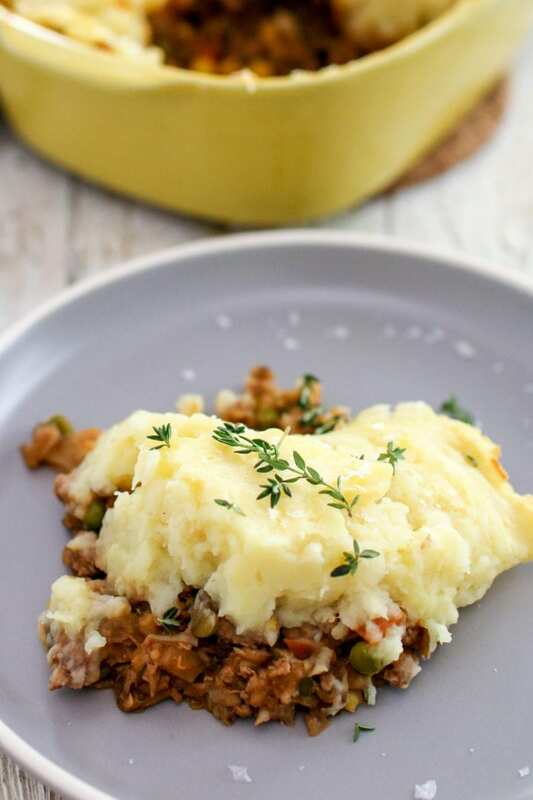 This all-time favourite recipe with a healthy twist is loaded with seasoned ground turkey, lentils, and veggies, all cooked in a savoury broth, then topped with fluffy potato and celery root mash. Boil the potatoes and celery root: In a large pot, add the celery root, a pinch of salt, and enough water to cover by 2”. Bring to a boil, reduce heat to medium-high and simmer for 15 minutes. Add the potatoes and cook for another 15 minutes until vegetables are fork tender. While the celery and potatoes are cooking, prepare the meat and vegetable mixture. 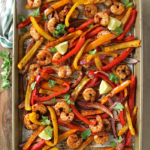 Prepare the meat and vegetable mixture: Heat the olive oil in a large skillet over medium-high heat. Add the ground meat and cook for 5 minutes, breaking up the chunks as you go along. Add the onions and garlic and cook for another 3 minutes until soft and slightly translucent. Add the tomato paste, red wine, tamari, lentils, thyme, rosemary, onion powder, garlic powder, chilli flakes, salt and pepper. Pour in the broth, stir and bring to a boil. Lower heat to a simmer, cover and cook for 15 minutes. Stir in the flour until well combined. Toss in the frozen veggies, stir and cook uncovered for 5 minutes until most of the liquid is absorbed. Prepare the potato and celery root mash: Drain the potatoes and celery root and transfer to a large bowl or back into the pot. Add in the butter, broth, salt, white pepper,and using a masher or whisk, mash until smooth. Then take your hand held mixer and mix until creamy smooth. Spread the mashed potatoes and celery root over the meat mixture and smooth with a spoon. 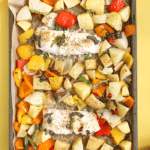 Remove from oven, and garnish with fresh thyme. Serve warm and enjoy! 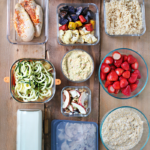 Store any leftovers in an airtight container in the fridge for up to 3 days or in the freezer for up to 2 months. *Note: If you’re using an iron skillet to cook your meat mixture you can leave everything in the skillet and add the mashed potatoes and celery root directly on top, then place in the oven to bake.